The Django Reinhardt Festival de Samois is the annual celebration to honor the legacy and memory of the guitarist/composer Django Reinhardt. As I’m sure that most of you know, Samois-Sur-Seine was where Django spent his last days. It is the most well-known of the Django festivals. It has run continuously since 1983, usually on the last week of June, Wednesday to Sunday.It wouldn’t be a stretch to say that for me and many of my fellow Djangologists that Samois-Sur-Seine is a near mythical place, a sort of Avalon of our collective hearts, where we can see Django’s final resting place, and to walk the streets that he walked, etc. It was in the Fall of 1951 that Django left Paris for Samois. He wanted to relax away from the hub-bub of Paris, a place where he could indulge his passion for painting and he loved to fish in the Seine. It was a transitional time for Django; Be-Bop was becoming popular and Django was a bit bored with the scene and he had visited Samois a few years before and fell in love with it. He moved into 5 rue du Bas-Samois with wife Naguine and young son Babik. On May 16, 1953 Reinhardt passed out and fell while having a morning cup of tea at a café called Auberge de I’Île, (Chez Fernand). He was taken to the hospital at nearby Fontainebleau. He died, having never regained consciousness. The cause was listed a cerebral hemorrhage, he was just 43 years old. The author having a bit of a jam at Chez Django, 2014. Thanks to Andrea Carlson for lending me her guitar. I have been going to the annual Festival there since around 2006. 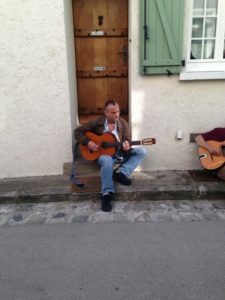 A professional musician all of my life, I had been bitten by the Django bug, and had been studying Gyspy Jazz with Stephane Wrembel and Fapy Lafertin. I fell in love with the bucolic old town immediately. I made the pilgrimage to Django’s grave in the church cemetery, jammed and drank beers in the town square, etc. Hanging with my fellow Django-nerds I felt that I had found my ‘tribe,’ if you will. I recall one year hearing two fellows jamming in the town square. They turned out to be Titi Bamberger and Lollo Meier! Irene Ypenberg, guitarist and artist was jamming too, and I got to know her and Titi. Later on they came to the states. Titi played a show with us, and played on our last CD, called ‘Gypsy Routes’. Irene did the cover art. The festival itself was on the I’Île de Berceau, a little island very near the house that Django had rented. In 2016 severe flooding of the Seine necessitated a last-minute move to Fontainebleau, and the 2017 festival will be in Fontainebleau also. Here’s a little interview with my good friend Menno Van Der Reijden. Barry; I usually say that you are the unofficial Mayor of Samoreau campground. The frindly pipe-smoking bloke who welcomes all to Samoreau. So how long have you been going to Samois-Samoreau? I’ve been coming there since 2001. What are some of your memories that stand out the most? Seeing the rising stars of guitarists Adrien Moignard and Sebastien Giniaux and singer Cyrille Aimée- Daudel. They were mere teenagers when I joined the ranks at Samoreau. Gifted kids for sure! Next to rhythmic bedrock Mathieu Chatelain they evolved so fast over the ensuing years. I still see Ricardo Weiss and his family scooping young Adrien off from his 3AM jam to the gypsy camp to show his skills in front of the real gypsies. Adrien returned around 9AM totally wasted from the German beers, but also knowing he showed them something worthwhile. And I remember fondly a 2003 a jam contest between Adrien Moignard and Alfonso Ponticelli at 5 AM where both knew how to play their tunes and deviate from them enough to interpose another tune and come right back to the original. I kept providing D and G strings!. The early years had a Friday till Sunday festival and what really drew us out was the Friday night concert, for after that finished we could use the same stage and equipment. The sound people would stay behind to plug us in. One group in particular stands out, and besides Adrien Sebastien Mathieu there was violinist Alexandre Cavaliere and double bass player Jarrod Coombes. They rocked da house! From that time on my rhythm skills improved and by learning from the best at the campsite I was able to hold my own in any jam. We have seen changes over the years. Chez Fernand is gone, [though the site is still there of course]. I’ve never known Fernand but he is buried near Django, but on the other side near the wall in unhallowed ground. Babik owned it for awhile, then when the next owner passed away a foundation was formed in part to save all of the Gypsy Jazz memoribilia that was there. Angelo Debarre took over and things looked good OK for a bit. Unfortunately he too lost too much capital and the place became a Wine-bar/Pizzeria with tube lights and a cold impersonal atmosphere. All of the Django memoribillia is gone. Yes, that was a real shock to me when I saw that Chez Fernand was gone. So, as you know it looks like the festival de Samois will henceforth be at Fontainebleau. [Last year because of the flooding in Samois, and now because of security concerns about the island]. The officials in Fontainebleau stepped in last year and they really saved the day with very short notice, and of course we all really appreciate it, but it is a change now that we have to adapt to it. And this year it looks like the Festival is scheduled for the 2nd week in July, while the camping at Samoreau is last week of June into July. I’m not at all comfortable with this decision. Of course in 2016 it saving the day as cancelling was an option nobody was keen on. But now the new anti-terror laws are responsible, and perhaps the people in charge at Fountainebleau are able to get some big sponsors involved. What better place to hold the festival than that secluded bit of castle ground between walls and moats? More people fit in, so it can be more proftable as well. To please the masses the program switches graduallly toward that of any festival around the globe, mainstream jazz, hip hop, whatever, but I sometimes feel that the gypsy jazz feel that it once has is rapidly diminishing. To give some Samois feel back to the gypsy jazz lovers there will be a 12h concert in Samois square on Sat July 1st from midday till midnight. The program is one the Festival website and is almost entirely Jazz Manouche. Alas no spontaneous jamming that day. 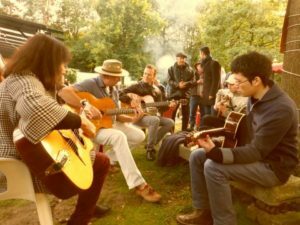 Following Eddy Archtop Parson’s lead I try to welcome musicians to Samois by hosting the Facebook page ‘Samois Going Djangofiles.’ I put intel from the Samois festival site and some more for the people that go camping. Every year I organise an afternooon jam at the city square in Samois. Since 2013 that also serves to give people the opportunity to buy tickets at the nearby Django-office and pay their respects to Django at the nearby cemetery. The jam started with just four of me and my mates but last year grew to two large tables at one restaurant and three round tables at the other. Nice to meet guys that camp elsewhere and play a few tunes together. Please feel free to add any other thoughts and musings. What thrilled me enormously was meeting some guys and girls I only knew from the Yahoo! GJ Group in the flesh. Papi Alain Cola peddling his Del Artes, Pat Phillips popping by scouting, Jacques Mazzoleni Looking for ancient GJ guitars, and also meeting you Barry! If you go; check out the festival website for info. There will be many amazing luthiers as always; AJL Guitars, Maurice DuPont, Leo Eimers, etc. You’ll have a chance to meet your fellow Djangophiles. And, I am very happy to say that my good friend and ‘brother from another Mother’ Stephane Wrembel will finally be perfoming with his group, so go! There will be some concerts in Samois before the festival in Fontainebleau, and of course visting Django’s resting place is a must. I especially want to thanks Mme Muriel Vandenbosse, press liason for the festival for her help and for her tireless work for the festival. And many thanks to mon frerre Olivier Colson, for renting to me, lending me his bike, being a great guide and friend! Lastly, Menno’s opinions are his own of course. He doesn’t pull punches. He has been dedicated to helping everyone at Samoreau and Samois. Thank a terrorist for the move, basically. Since the original site is a small island, too hard to secure in the aftermath of the terrible attacks in France. I’m omitting the player’s name out of respect. Many know anyway, but he’s the real deal, so respect is in order. I had heard that Angelo was maybe a partner, or was hired to help promote business, not sure. Unfortunately, it’s a sleepy town just a few weeks out of the year, so running a Restaurant-bar there is a tough deal. I hope to do a piece on the story of Chez Fernand at some point, when I can gather some more info. Unfortunately, the reality of it is that the festival wouldn’t be financially viable if it only featured Gypsy Jazz. I recall my surprise the 1st year that I went. I heard an R & B cover band doing some of the same material that my Cover band at the time played. I have heard some fantastic non-Gypsy Jazz acts, Pat Metheny, Cecile McLorin-Salvant, and my friend John Pizzzarelli, and others. And again, without some main-stream jazz or crossover artists there wouldn’t be a festival. Posted by Barry Wahrhaftig on June 5, 2017 at 2:36 pm in News.